A 15-year-old boy has been charged with intent to cause grievous bodily harm, after a teenager was sprayed in the face with a "corrosive substance". 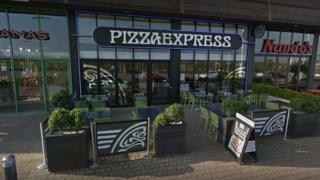 The attack happened near Pizza Express at Cribbs Causeway in Bristol, at about 20:45 BST on 1 September. Police said a 16-year-old boy who was injured has been discharged from hospital but is still having treatment. The 15-year-old is currently in police custody and will appear at Bristol Magistrates' Court later.